How significant was Martin Luther King Jnr to the success of the Montgomery Bus Boycott? 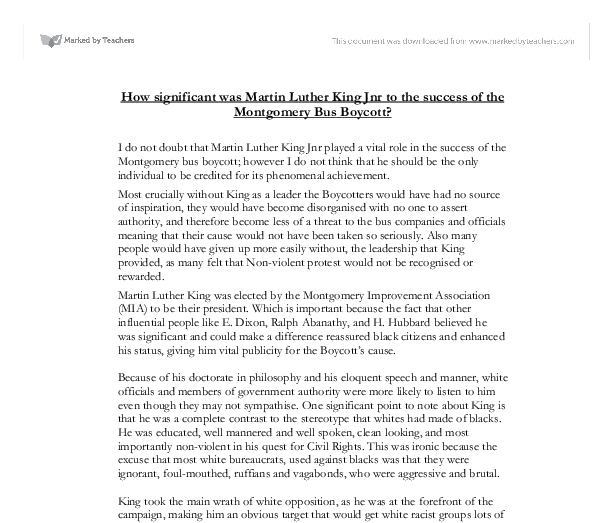 How significant was Martin Luther King Jnr to the success of the Montgomery Bus Boycott? I do not doubt that Martin Luther King Jnr played a vital role in the success of the Montgomery bus boycott; however I do not think that he should be the only individual to be credited for its phenomenal achievement. Most crucially without King as a leader the Boycotters would have had no source of inspiration, they would have become disorganised with no one to assert authority, and therefore become less of a threat to the bus companies and officials meaning that their cause would not have been taken so seriously. Also many people would have given up more easily without, the leadership that King provided, as many felt that Non-violent protest would not be recognised or rewarded. 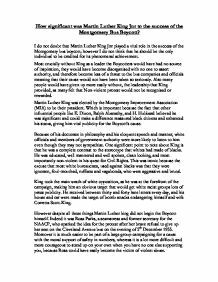 Martin Luther King was elected by the Montgomery Improvement Association (MIA) to be their president. Which is important because the fact that other influential people like E. Dixon, Ralph Abanathy, and H. ...read more. He received between thirty and forty hate letters every day, and his house and car were made the target of bomb attacks endangering himself and wife Corretta Scott-King. However despite all these things Martin Luther king did not begin the Boycott himself. Indeed it was Rosa Parks, a seamstress and former secretary for the NAACP, who sparked the idea for the protest after her brave refusal to give up her seat on the Cleveland Avenue bus on the evening of 5th December 1955. Moreover it is much easier to be part of a large group campaigning for a cause with the moral support of safety in numbers, whereas it is a lot more difficult and more courageous to stand up on your own when you have no one else supporting you, because Rosa could have easily become the victim of violent abuse. As well it was a joint effort by national organisations like CORE, the NAACP and individuals like E. ...read more. Not only these things but King was not the only person to face violence or abuse from opposition. Reverend Robert Graetz; a white minister who served a mainly black community in his church, had his house bombed, while other members of MIA received threatening letters. On the streets the boycott had angered some white extremists, leading to blacks having eggs or other food substances thrown at them. However some whites approved of the cause and of demonstrating though non-violent protest. Therefore I believe it is fair to say that Martin Luther King Jnr played a significant role in the Montgomery Bus boycott, but that it would not have been the astonishing success that it was without the help of other individuals and organisations and the three thousand or more black and white citizens who kept the boycott up for 381 days. 1 Pg. 40 Causes and consequences of the African American Civil Rights Movement. ...read more. This student written piece of work is one of many that can be found in our GCSE USA 1941-80 section. What role did Martin Luther Kings play in the Montgomery bus boycott? He had already rejected an offer to lead the local NAACP, he did, however, allow the church to be used as a meeting place and it was here, following the arrest of Rosa Parks, that the boycott was provided with a location, inspiration and some finanicial aid. King was concerned with the government passing the Civil Rights Act in 1964. After the passing of this important piece of legislation, King concentrated on helping those suffering from poverty. King realized that race and economic issues were closely connected and he began talking about the need to redistribute wealth. they used bombs to frighten the blacks off: they burnt down black churches, schools and hospitals. In 1955, a bomb was thrown into the house of Martin Luther King who wrote about this incident in his book "Stride towards Freedom": I walked out to the porch and asked the crowd to come to order. Imagery is also utilised by King to describe place, something that could otherwise take away from the passion and movement of the speech, such as the audacious examples "the red hills of Georgia" and "every hill and every molehill of Mississippi."